While I was in the throes of wedding planning late last summer, my mom was organizing some big life changes of her own. Namely, moving out of the townhouse that she’d owned for over a decade. With my brother and me grown and gone, the three-bedroom home had become more than one person—and an admittedly oversized cat—really needed. Moving out was one of those decisions that, on paper, made a whole lot of financial and logistical sense. In real life, it also meant sorting through and packing up, or saying good-bye to, all those years’ worth of stuff. Nearly every day, and often a couple times a day, my mom would text or call me to ask about something that she had come across. Sometimes it was something from my childhood or high school years—cheerleading sweatshirts and hand-knotted blankets made at squad sleepovers, colored modeling clay that predated my teens, boxes full of essays and stories and poetry. Other times, she’d send me photos of things that had been hers, that had decorated the house or been tucked in the back of a cabinet somewhere, rarely or never used. Many of those things wouldn’t have been worth the cost to ship them, most wouldn’t have fit in our apartment had they been sent. One day she sent me a photo of a squat, two-tone glazed clay pot. She explained that it was a bean pot, an antique now, that her mom had used to bake beans in the oven. It was handed on to her and she thought that I might enjoy using it now. I wasn’t entirely sure what I would do with it, but I was thrilled at the prospect of being the third generation to welcome it into my kitchen. I told her to send it over. I hate to admit it, but I had almost forgotten about the cute little pot when I stumbled upon a post about cooking beans in the oven nearly half a year later. It returned to the forefront of my mind, though, and the possibilities began stacking up. I wrote a post on cooking beans about a year ago, and those methods hold if you’re looking to replace canned beans. But if you want a creamy, flavorful pot of legumes? I’m convinced this is the way to go. It takes a couple hours once they’re in the oven, but cooking beans this way requires no plan-ahead. No soaking. No fast-soak method. 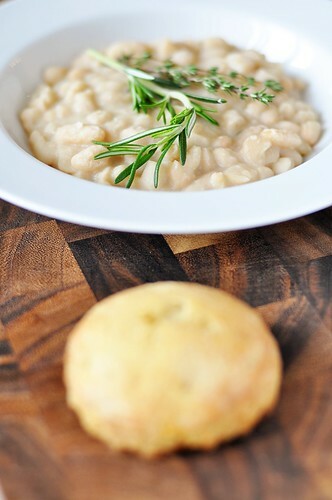 Just toss the beans in a pot, cover with water, and bake. 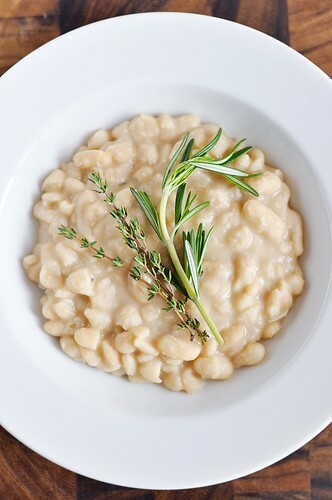 My first venture with this method was a pot of cannellini beans baked with a bundle of rosemary and thyme, several cracked cloves of garlic, and a Parmigiano rind. The smell as they cooked was tremendous, and the result was a pot full of tender, velvety, deeply-flavored beans. All those whole cloves of garlic softened and melted away, becoming entirely indistinguishable, while the herbs and rind exhausted themselves, giving over all their virtues in the slow heat. It was the easiest pot of beans I’d ever made. And they were remarkable. Which is why I’m sharing them with you today. This recipe requires virtually no prep work. You don’t even have to dirty a knife, save for using the flat of it to crack your garlic. Everything goes into the pot whole and comes out melded and beautiful. There’s something so unassuming, something almost rustic, about sitting down to a bowlful of beans, a piece of crusty bread within reach. It’s simple and nourishing, grounding. And for me, the little pot that I cook mine in incites that very special, intangible connection to my mother’s and grandmother’s kitchens. It’s something that I can’t even begin to convey. Gather the rosemary and thyme together and tie tightly into a bundle using kitchen twine. 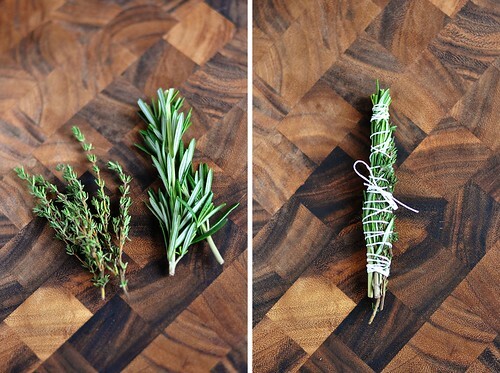 Wrap the twine so that the rosemary needles are held in; whole rosemary needles aren’t pleasant to eat. 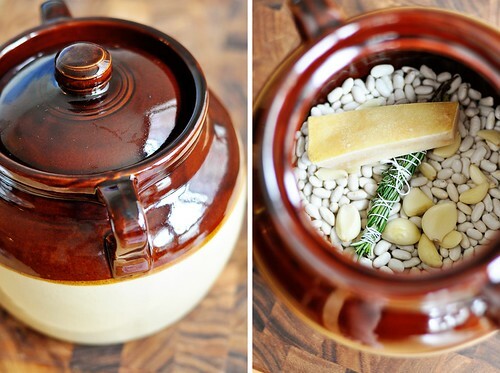 Place the beans, whole garlic cloves, the herb bundle, and the Parmigiano rind into a ceramic or clay pot with a tightly fitting lid (a Dutch oven would work as well). Add cold water to cover the ingredients by one inch. Add the salt and give everything a good stir. Place the lid on the pot and set it into the oven. Stir once during the first hour and a half of cooking. After that hour and a half, stir and observe doneness. 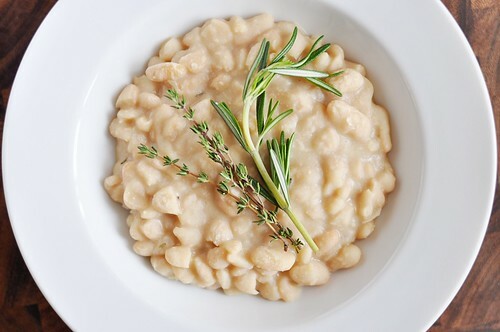 If the beans seem close, cook in 15-minute increments, stirring after each, until done. If the beans aren’t close after the hour and a half mark, give them another 30 minutes, stir, and then cook in 15-minute increments as described above. The beans should take 2 to 2 ½ hours in total. They will be tender to the bite and creamy when done. When finished, allow the pot to stand outside of the oven for 10-15 minutes; the pot liquor will continue to thicken. Discard the herb bundle and Parmigiano rind. Taste and adjust for salt if needed.